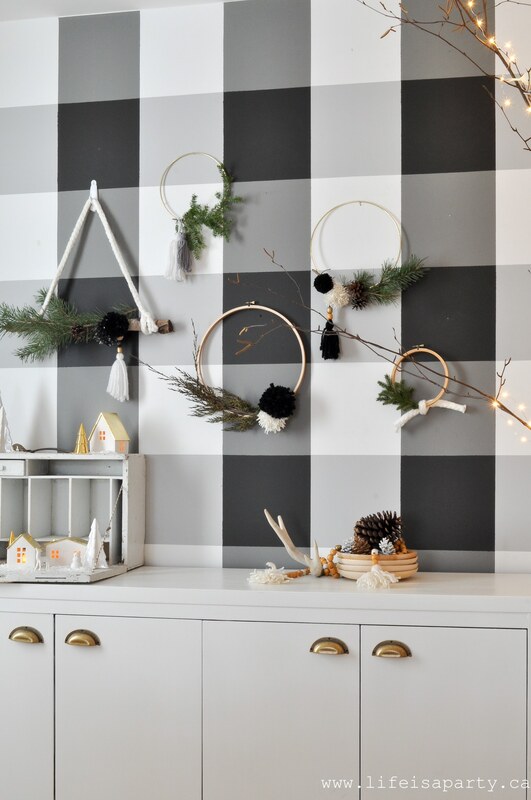 Christmas Home Tour 2018 -Black and White Scandinavian design with a little boho. 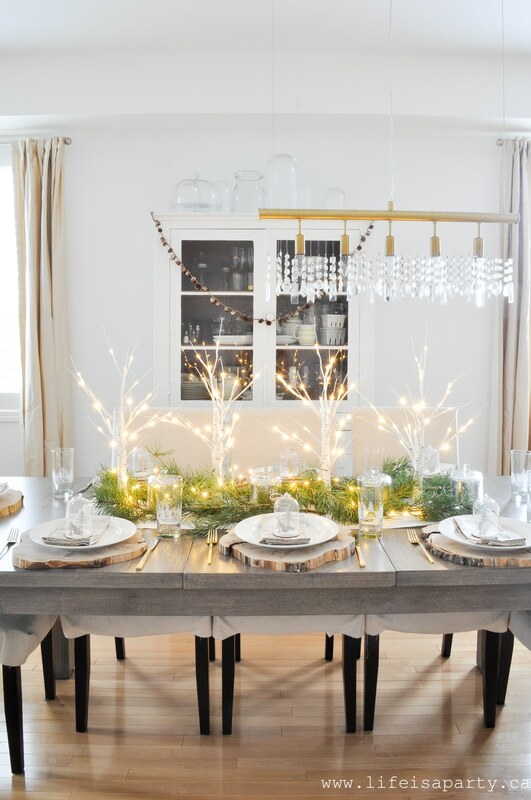 Lots of natural elements, cozy texture and Christmas twinkle lights. 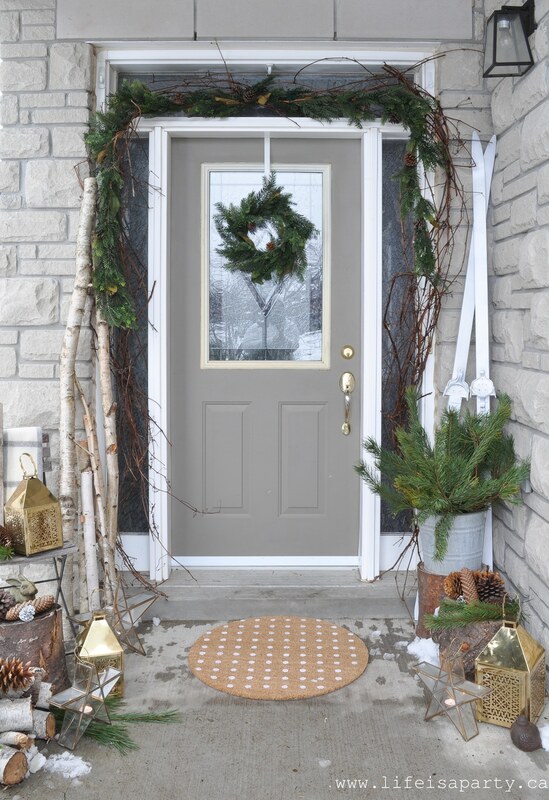 I’m so excited to be sharing my home all decorated for Christmas today with the Seasonal Simplicity Tour hosted by Krista at The Happy Housie. If you’re coming from the Happy Happy Nestor welcome. 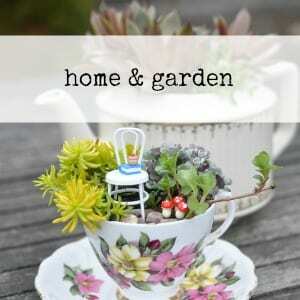 Isn’t Janine’s home beautiful, and there’s so much inspiration. My name is Dannyelle and I live near Toronto, Canada with my husband, a computer programmer (which comes in handy when you’re a blogger) and our two girls Paige and Maddie who are 11, and 14. 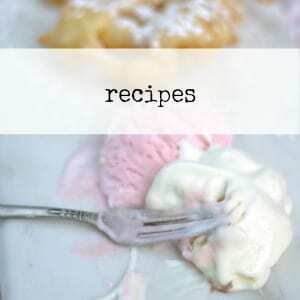 I love to blog about our home, DIYs, entertaining, and recipes. I hope you’ll come in and enjoy the tour. Let’s start with the front porch. 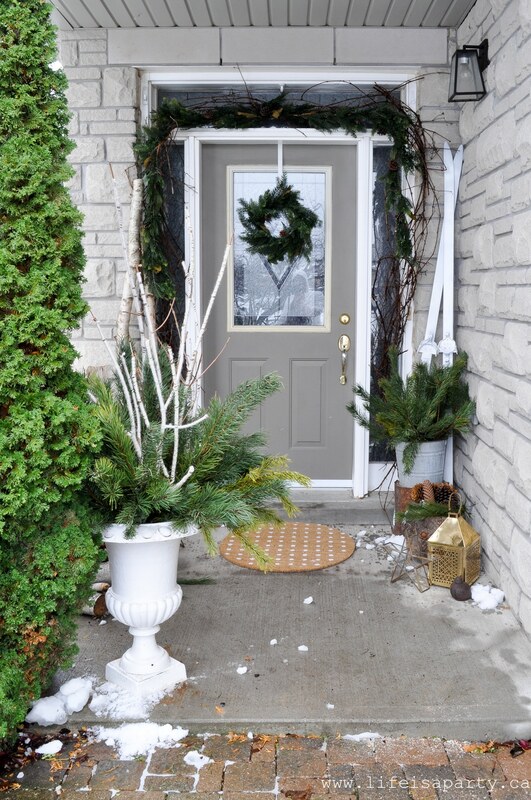 I always feel like the front door is a little taste of what’s to come inside. 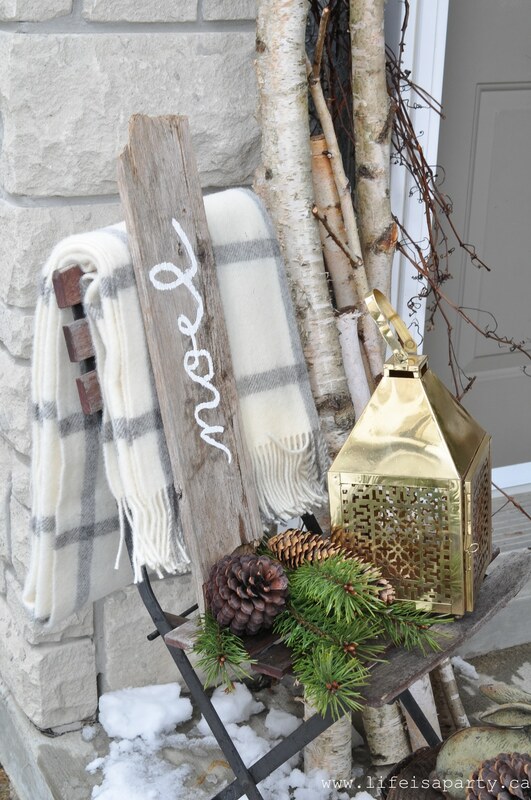 I love rustic Scandinavian style, especially at Christmas. 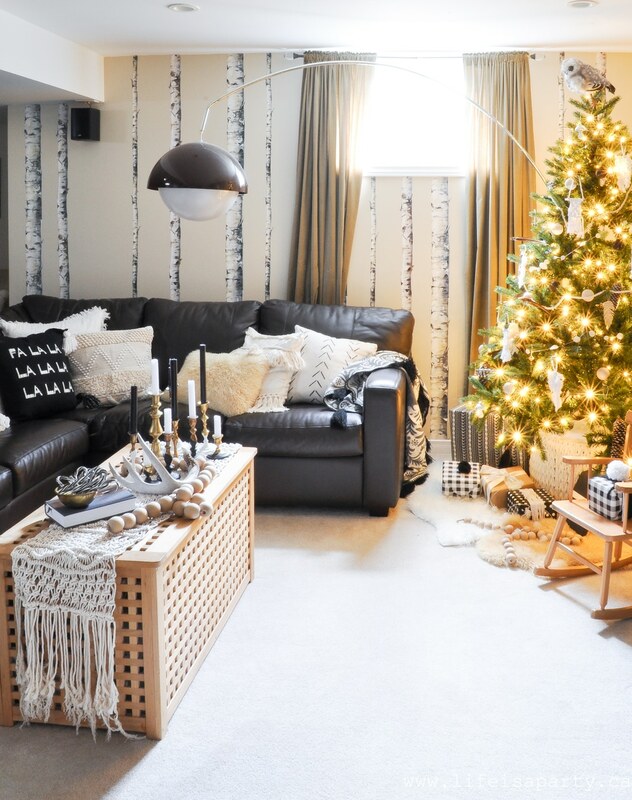 Scandinavian style is all about bringing the outdoors in and decorating with whatever is seasonal. 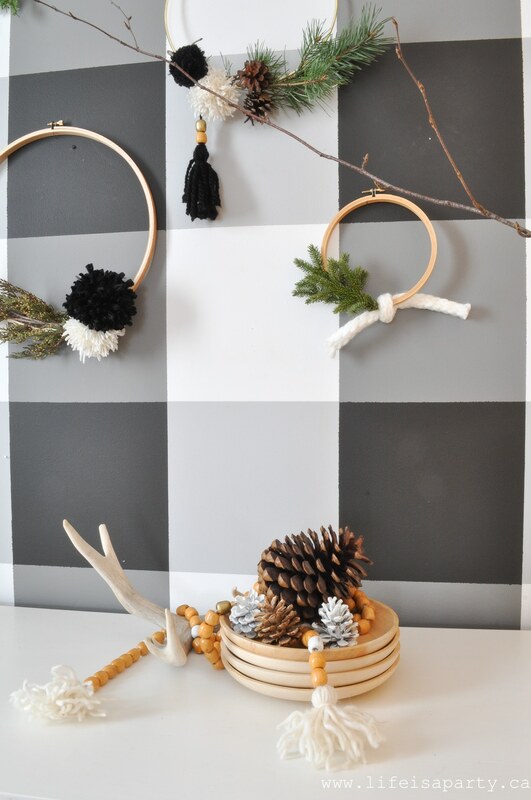 At Christmas that means lots of things like birch, pinecones, and fresh greens. 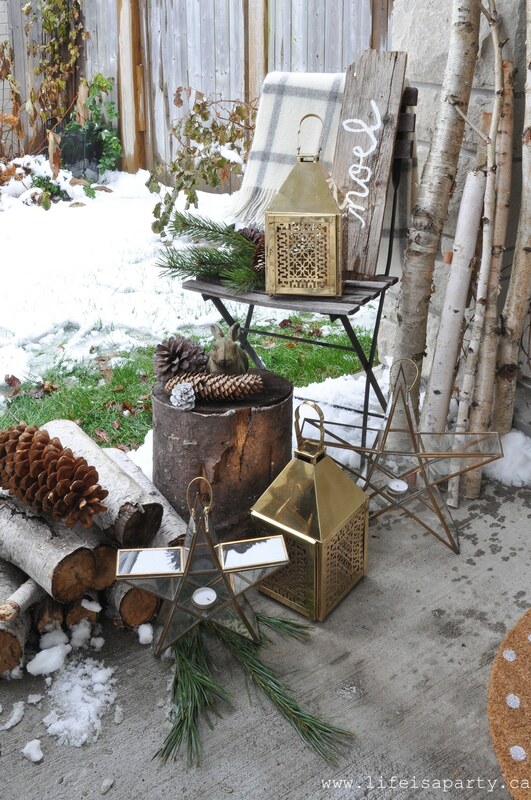 I’ve added some pretty brass lanterns this year too. I especially love the stars for Christmas. Over on the other side a fun little DIY. I couldn’t find any beautiful antique skis at a decent price so, I took some old ones from a thrift store and spray painted them white for a nice neutral look to fit in with my decor. 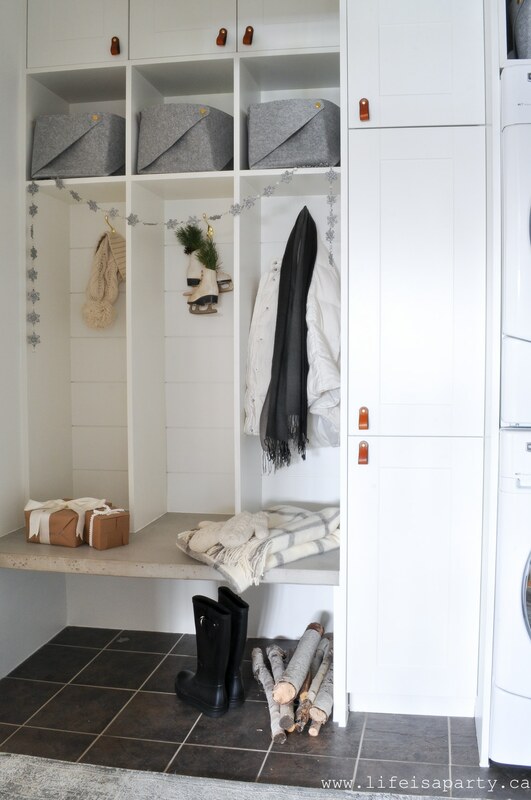 We just finished re-doing our mudroom / laundry room for the last One Room Challenge. It’s so much more functional and beautiful. I couldn’t resist dressing it up just a little for Christmas. 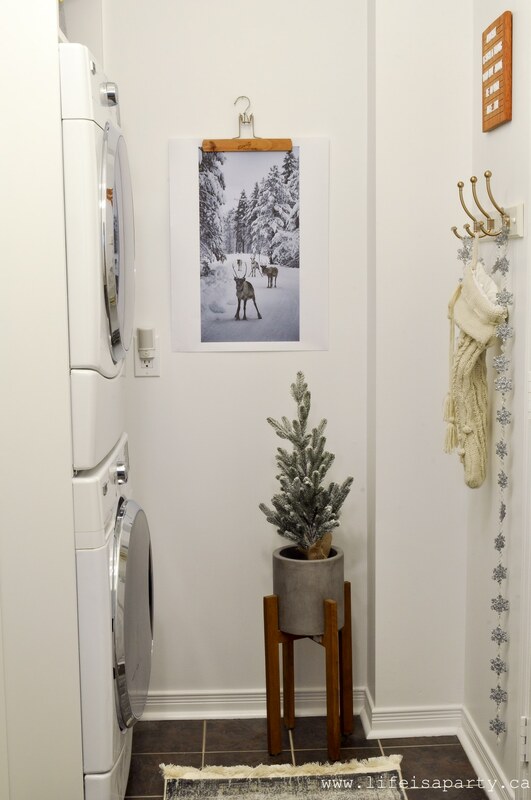 And over on the other wall a little festive art that can stay up all winter, hung with a vintage clothes hanger. The mudroom opens into our dining room. 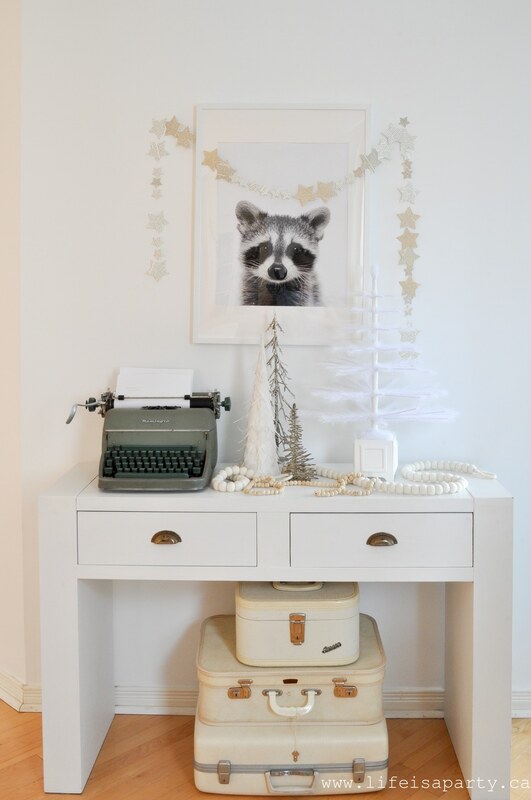 I kept the console table really simple with a little grouping of trees and some garlands. 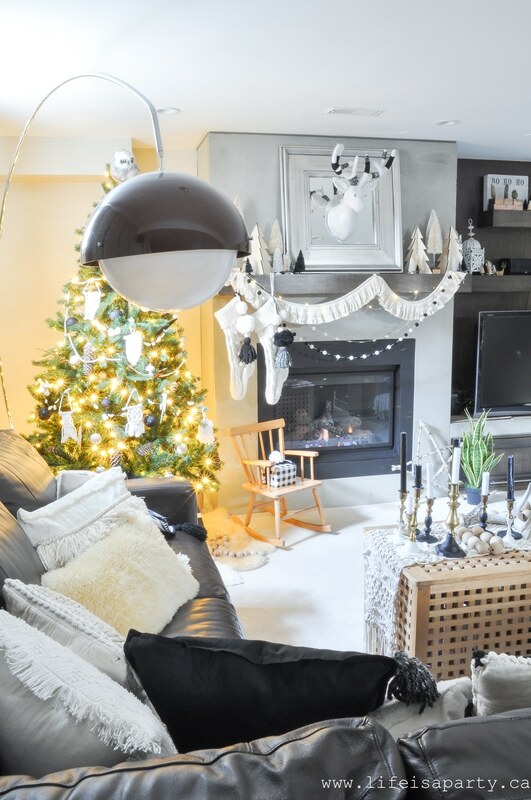 I wanted the main floor to feel really cozy this year, so I went with lots of whites, neutrals and texture. 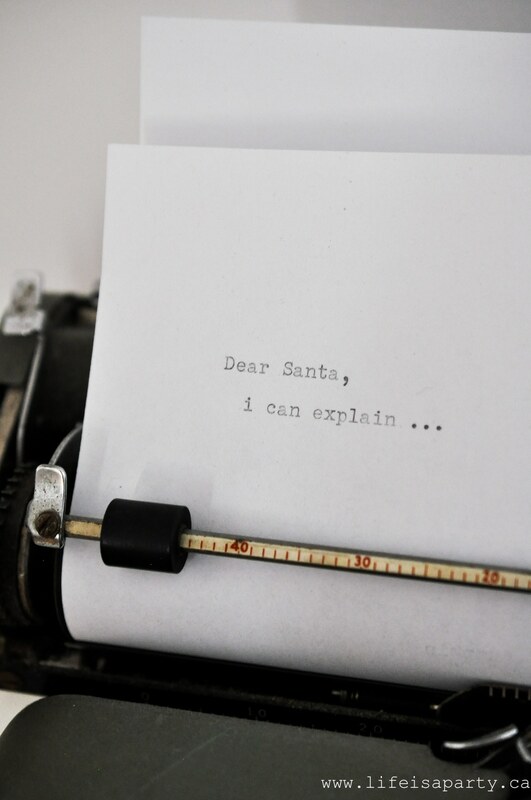 The vintage typewriter is an old favourite. 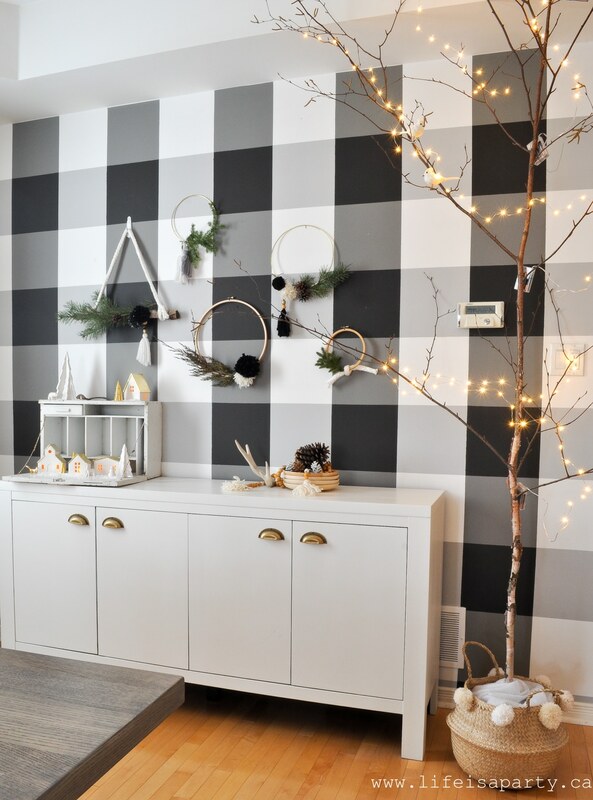 The rest of the room was inspired in part this year by these fun light up birch trees. I’ve got the table all set for Christmas dinner. 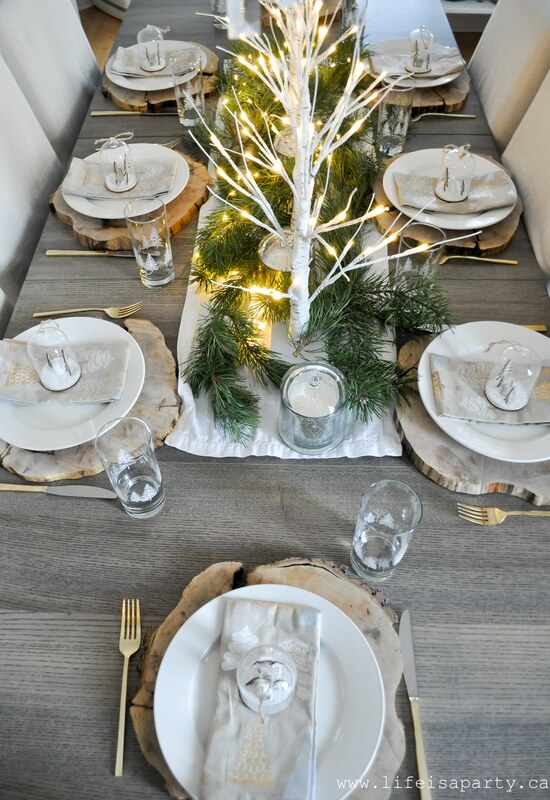 The table has a real rustic woodland vibe. 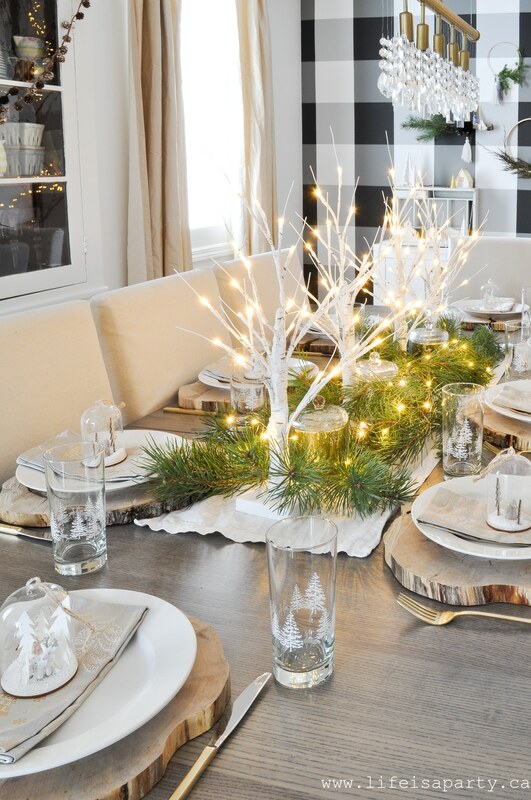 The centre piece is the beautiful birch trees, surrounded by some fresh pines and candles. 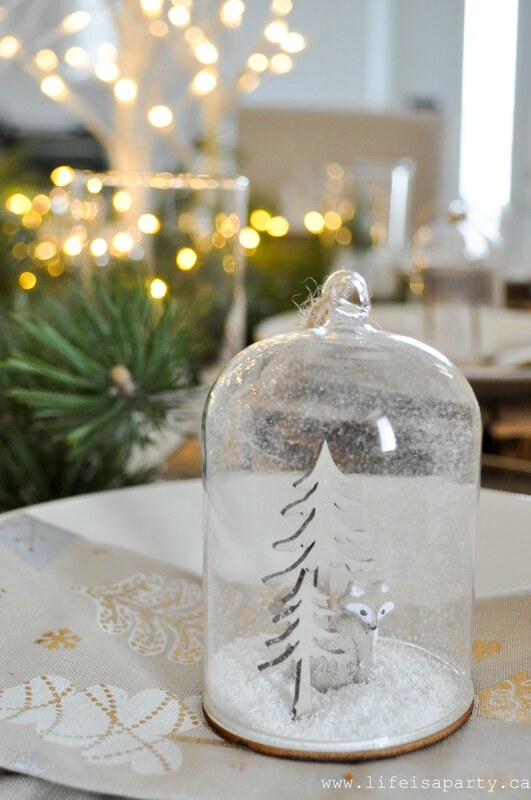 I used some rustic wood slice chargers, and layered on some festive napkins and these sweet little cloche ornaments. There are five different designs, and they’re all adorable. I thought they’d be a really sweet take home gift for my dinner guests on Christmas day. I also love the glasses. When I was a little girl, my parents had some that were very similar. They were kept on some open shelves in the kitchen and I remember my parents only really using them for mixed drinks when they had friends over for card games. 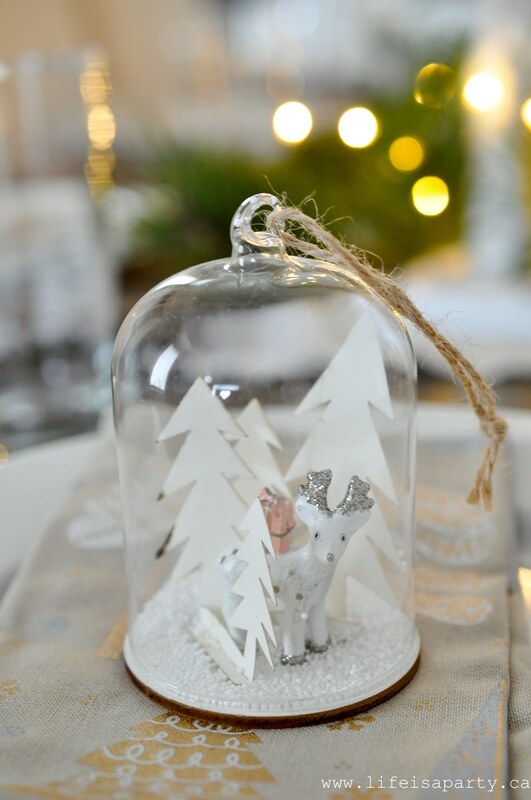 These have little pine trees on them and deer and they’re perfect for Christmas. 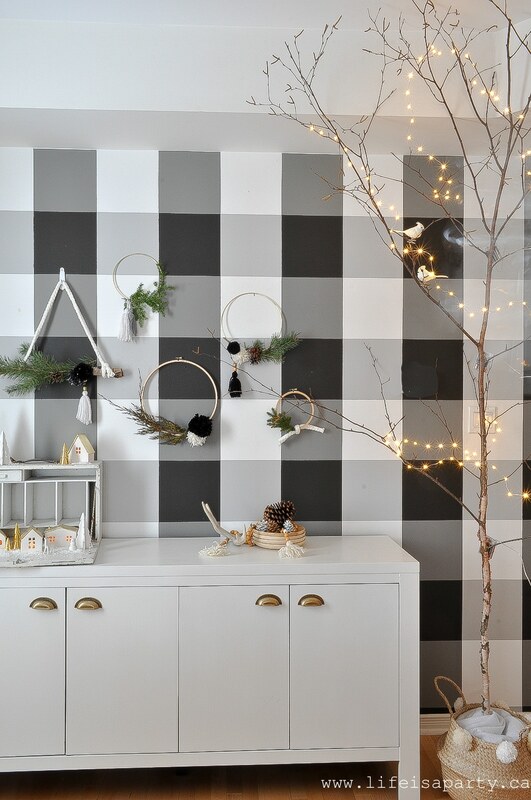 My buffalo check wall at the end of the dining room is all dressed up for Christmas too. I made a series of wreaths for Christmas. The birch one is the same as the one I made earlier, see the tutorial here. Two were made with gold rings, and two with embroidery hoops. 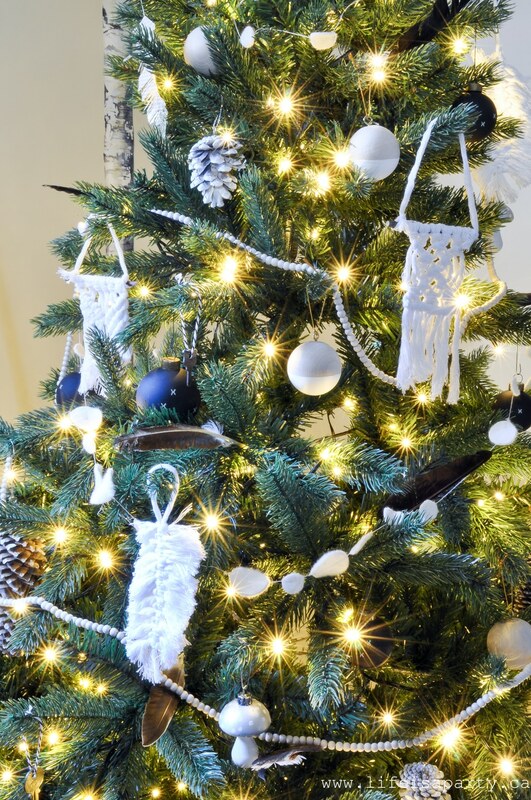 They’re updated from last year with their asymmetrical design, and some pom poms and tassels. I love how they turned out and they were so simple to make. 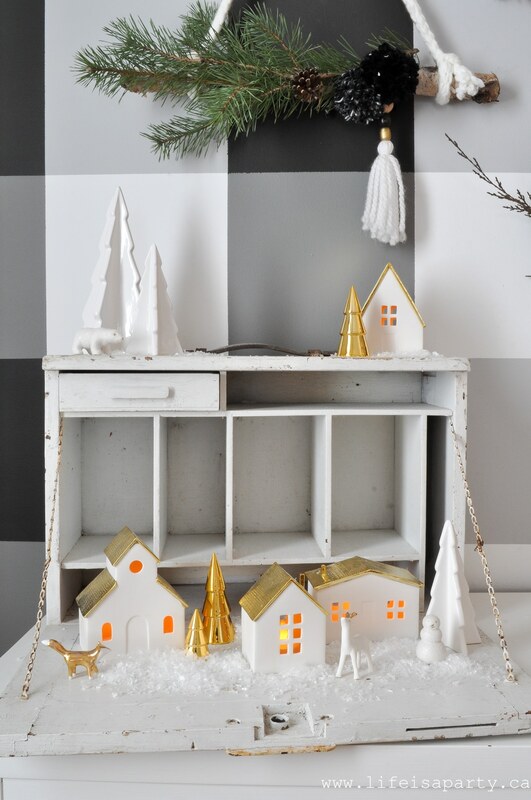 I set up my little Christmas village here too. It’s one of my very favourite Christmas decorations, and I love how they light up, and the little animals with them. Inspired by the birch on the table, I added a real one too. This one was found in the woods. I stood it up in the garage in a pail with some concrete for a few days, before I brought it in. 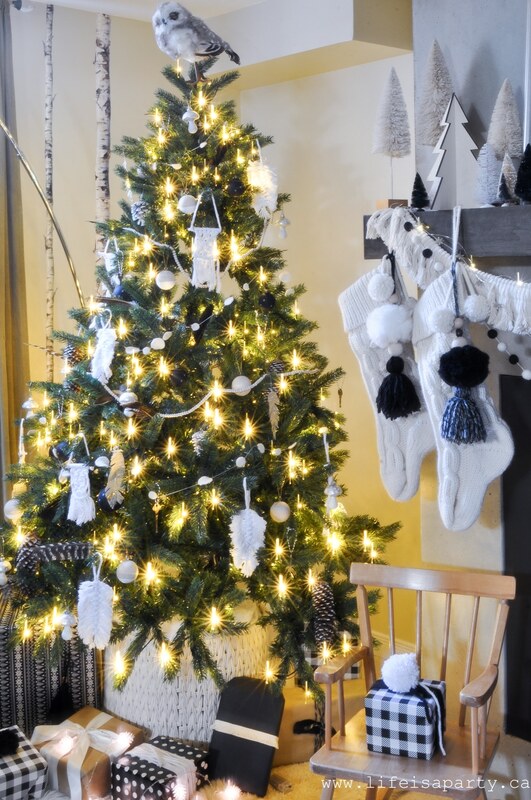 It’s so simple and pretty with the twinkle lights on it. And on the side a little collection of wood plates I found recently at the thrift store, dressed up with some pinecones, beads, and an antler. 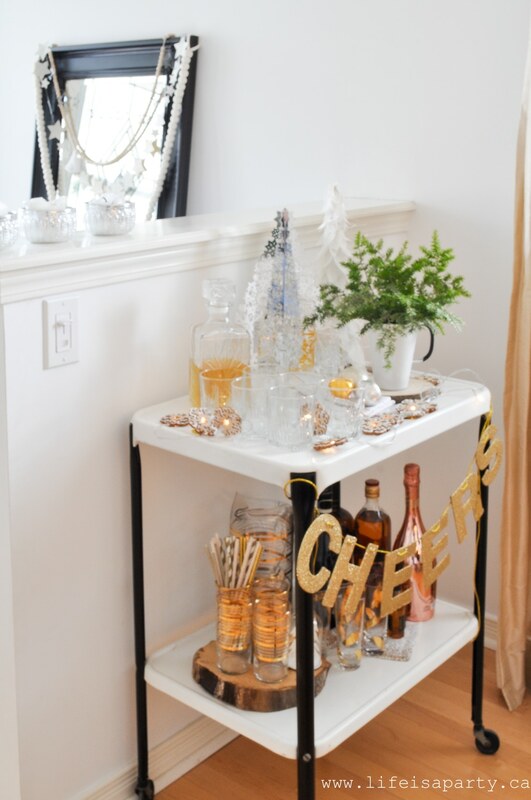 Over on the other side of the room, our little bar cart is all set up for some Christmas cheer. 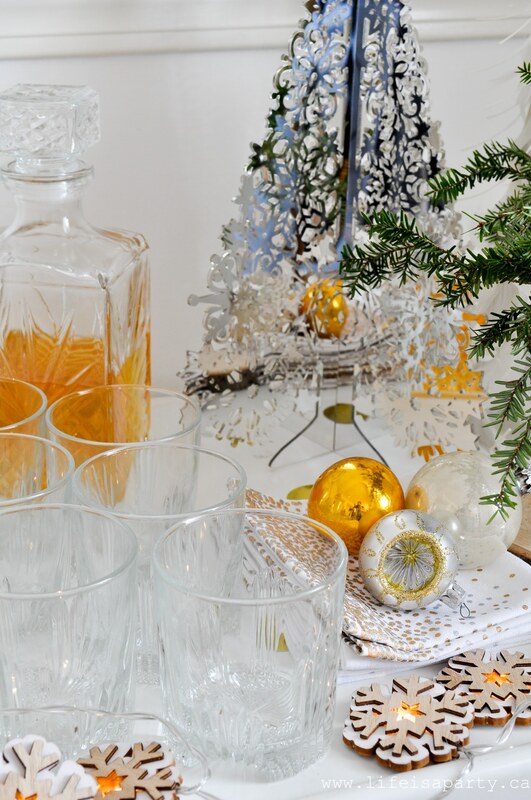 I’ve got a new decanter, and whiskey is on offer to warm up cold guests over the holidays. From the dining room, I thought we’d head downstairs to our cozy family room. 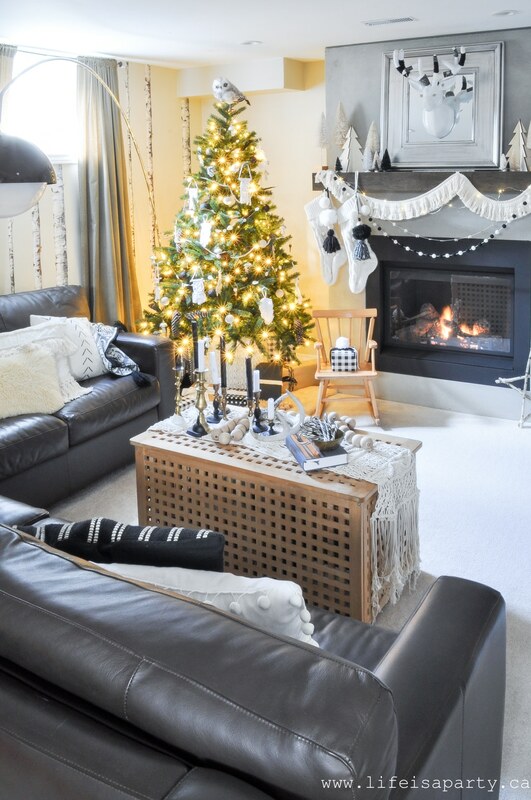 This is a favourite spot of ours over the holidays for family movie nights, and curling up with new books and toys over the Christmas holidays. 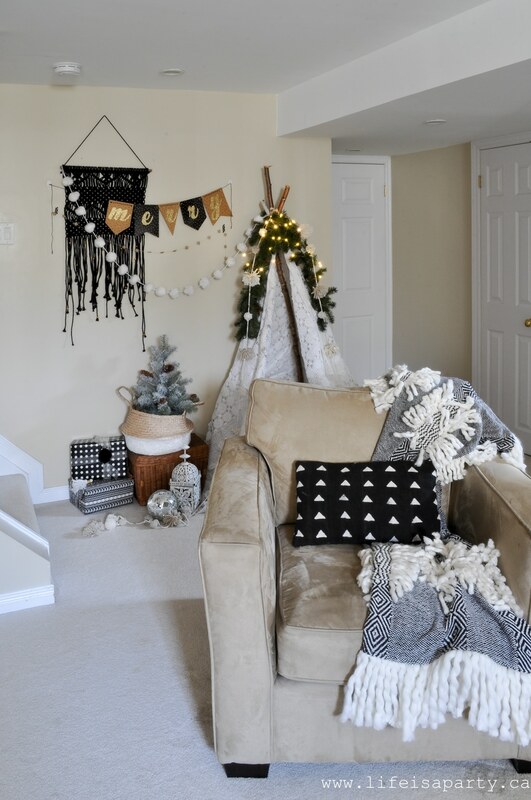 I’ve decorated with a black and white boho theme for Christmas, and I love how it turned out. The mantel is decorated with bottle brush trees -the few black ones got a little spray paint added to them. The deer head is paper mache, and I wrapped the antlers in some yarn to add texture. 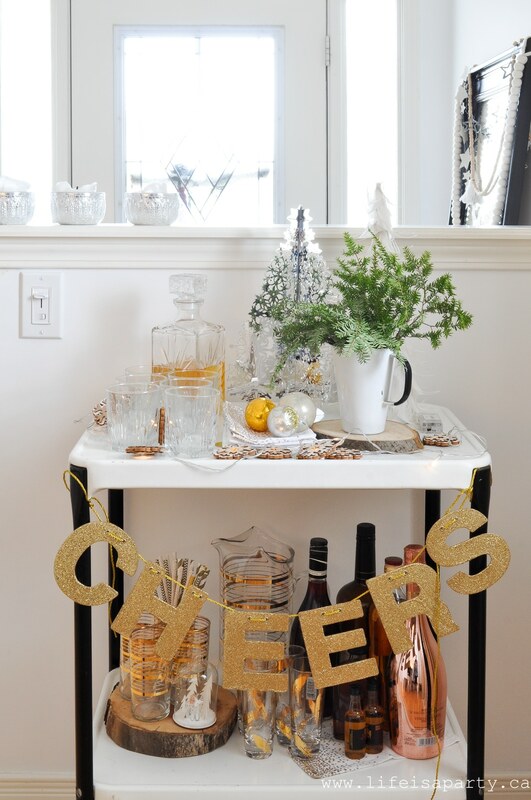 The fringe makes a fun garland, and the stockings are dressed up with some fun stocking tassels. You can read more details of the mantel here. 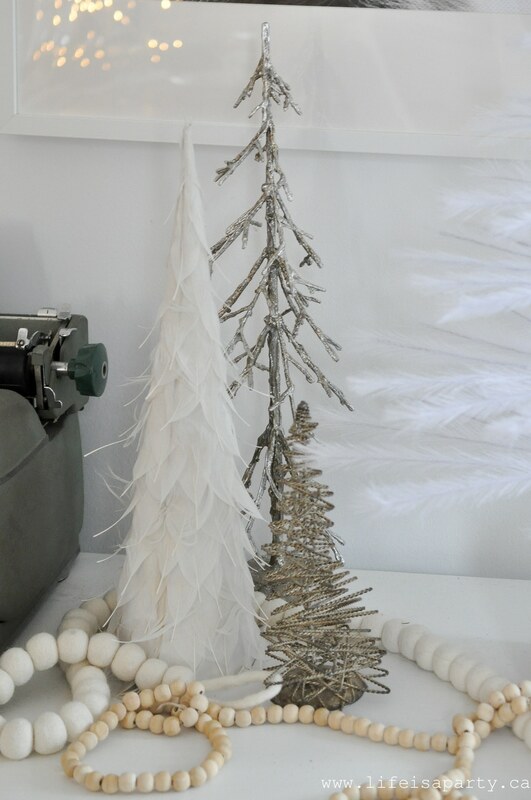 The tree looks great in its macrame basket, and with an owl as the topper. 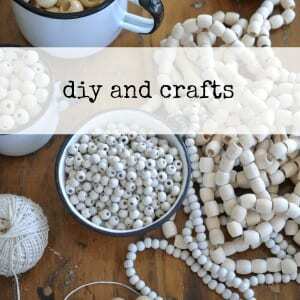 It’s decorated with lots of DIY ornaments, read more about how I made them here. 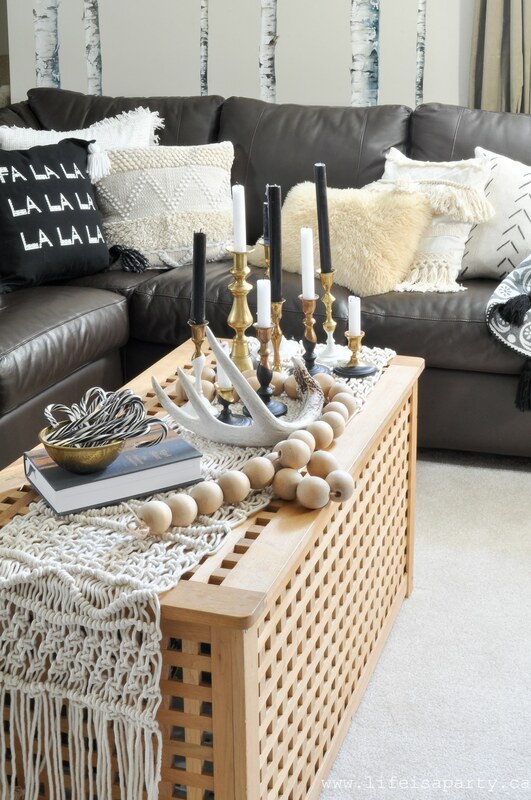 The coffee table is full of brass candle holders. I’m so looking forward to a little down time with a good book here over the Christmas break. This spot is just so cozy and sweet. 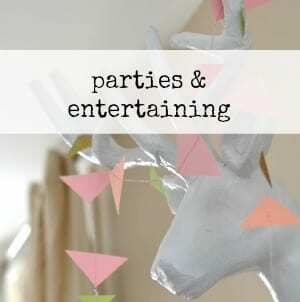 You can read all about how I DIY’d this little reading tent here. 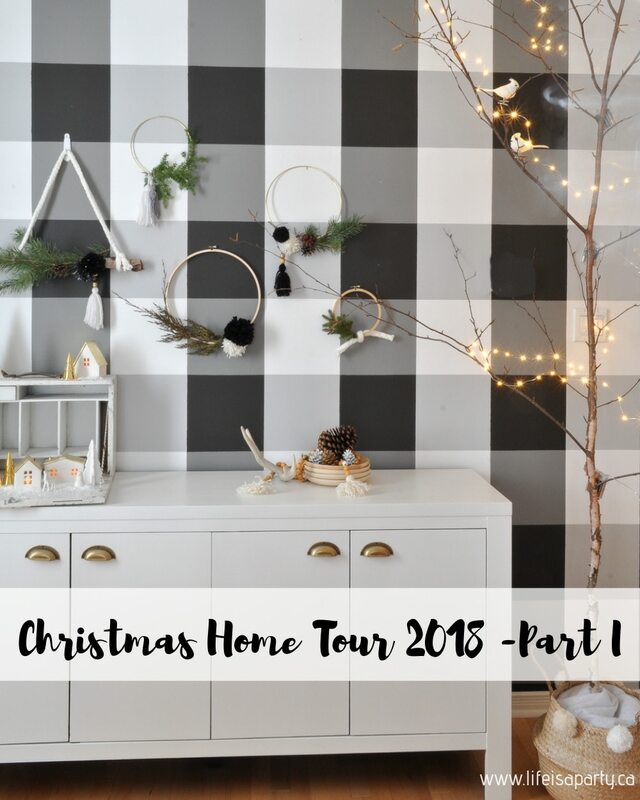 You can see the rest of my home all decorated for Christmas here with Part II of the tour sharing the living room, kitchen, study, and our master bedroom here. 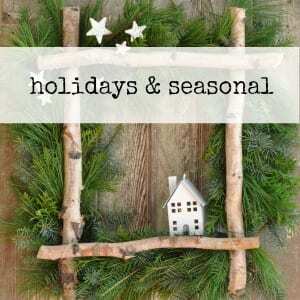 And now lots more inspiration as the Seasonal Simplicity Tours continue. Next stop on the tour is Two Twenty One -enjoy! And be sure to visit all the other Tuesday tours, and follow along all week with more tours each day. 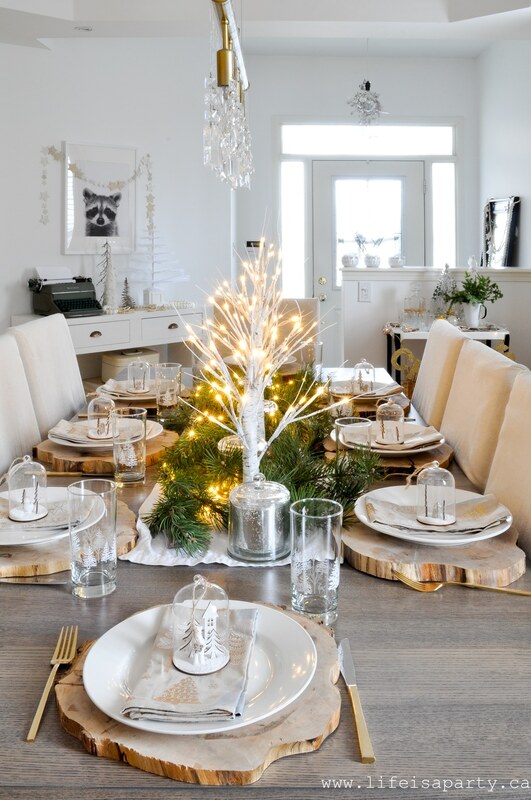 love everything especially your tablescape ! Christy, thank you so much. Wow! 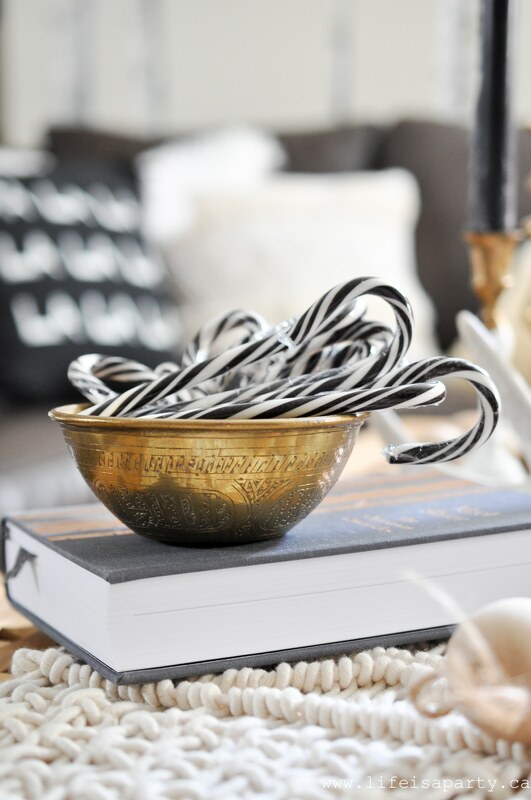 I love all the neutral and natural elements. That reading tent is such a cute idea. 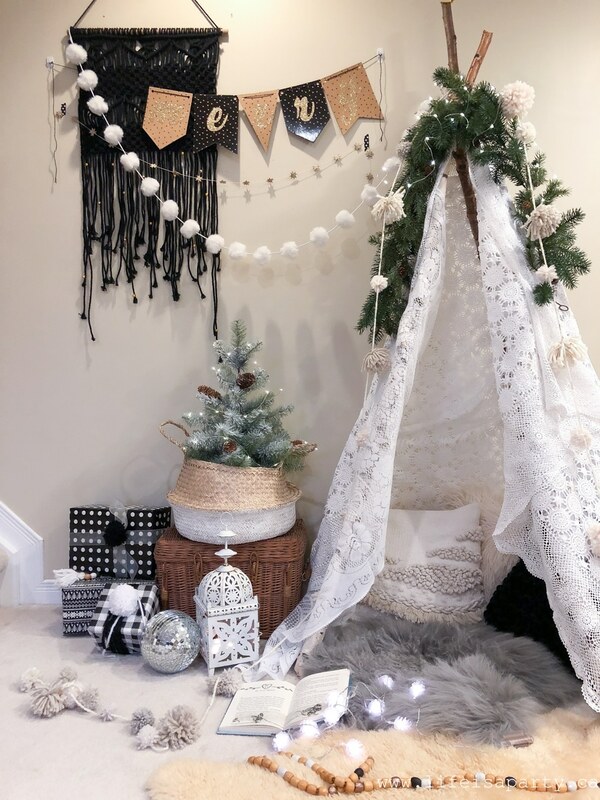 I am sure that will be the favourite spot to read Christmas stories! 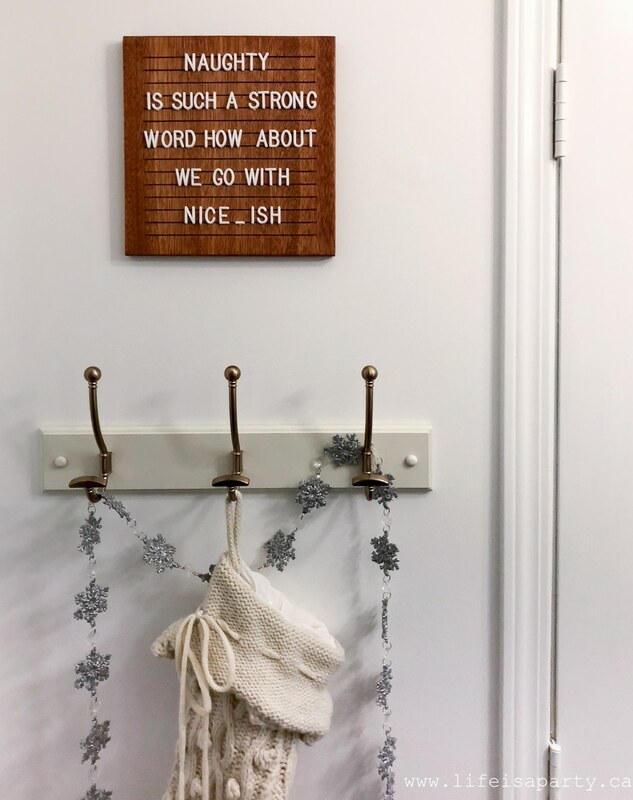 Thank you for sharing your home on the house tour. Krista, thanks so much. It was my absolute pleasure to join in on the tour. Oh my goodness, where do I begin! 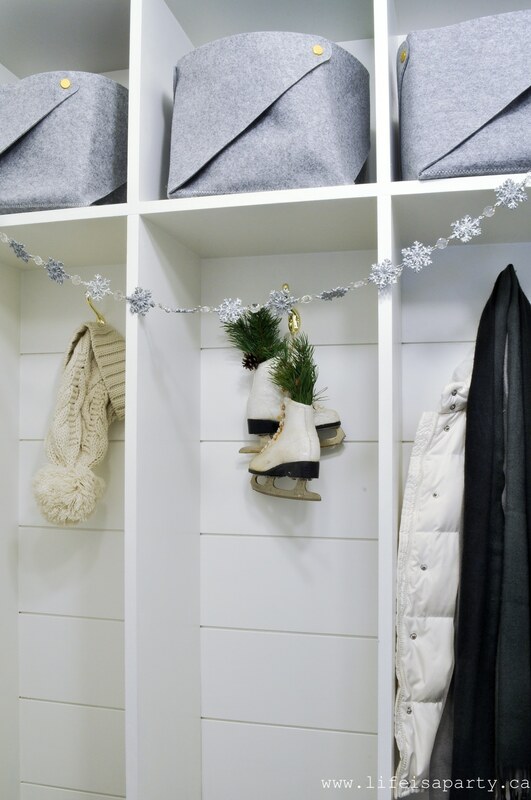 Your holiday home is so wonderful and you even have real snow! 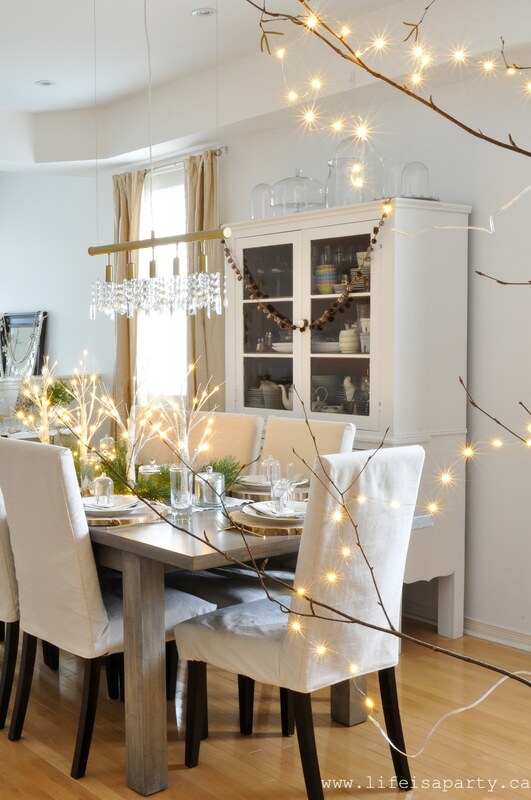 All your natural touches are so elegant and I especially love your branch in your dining room. I did the same but didn’t have such a pretty branch! Next year I’ll try it again. Loved reading and viewing your great holiday tour! Janine, thanks so much for stopping by and for the sweet comment. Merry Christmas. 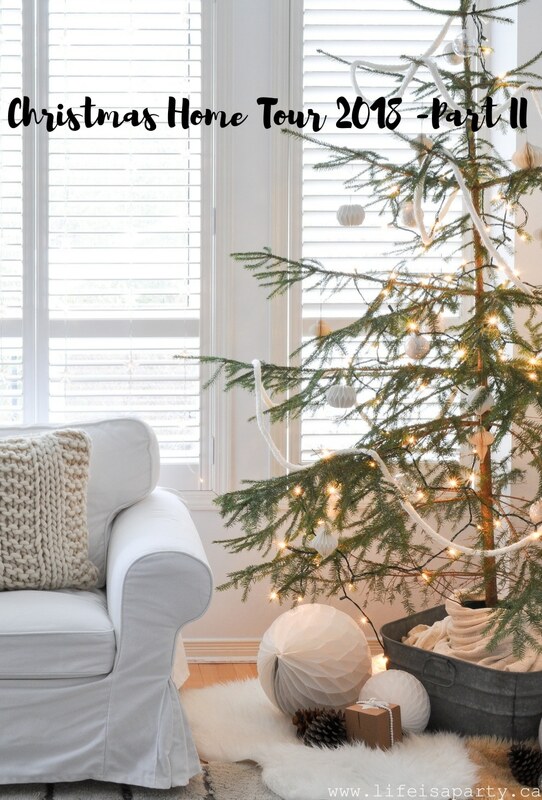 Your house looks so cozy! I love all the natural elements! And the table setting. And the basement pillows. Gosh. Looks so good, my friend! Thanks Shannon, you’ll have to come by and see it in person. xo.